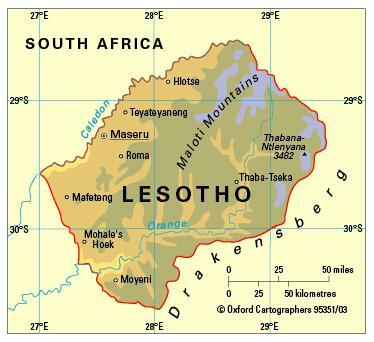 The Kingdom of Lesotho is a small landlocked country entirely surrounded by South Africa. It is known as the ‘Mountain Kingdom’, the whole country being over 1,000 metres in altitude. The country is divided into ten districts, each named after the principal town: Berea, Butha Buthe, Leribe, Mafeteng, Maseru, Mohale’s Hoek, Mokhotlong, Qacha’s Nek, Quthing and Thaba Tseka. The climate is temperate with well-marked seasons. The rainy season (receiving 85 per cent of total precipitation) is October to April, when there are frequent violent thunderstorms. Rainfall averages 746 mm p.a. Temperatures in the lowlands range from 32.2°C to -6.7°C; the range is much greater in the mountains. From May to September, snow falls in the highlands with heavy frosts occurring in the lowlands. The most significant issue is overgrazing, resulting in severe soil erosion and desertification. 2,052,000 (2012); 28 per cent of people live in urban areas. The population growth rate stood at 1.1 per cent p.a. between the years of 1990 and 2012. In 2012 the birth rate was 28 per 1,000 people (43 in 1970) and life expectancy was 49 years (49 in 1970 and 59 in 1990). The people are mostly Basotho, with a few thousand expatriate Europeans and several hundred Asians. Lesotho is classified as a lower-middle-income economy by the World Bank.